are lots of beautiful young, crisp, tender runner beans from our vegetable garden. At their best cooked immediately after picking and served al dente. These home-grown beans are succulent and bursting with flavour. Supermarket beans just don’t compare. 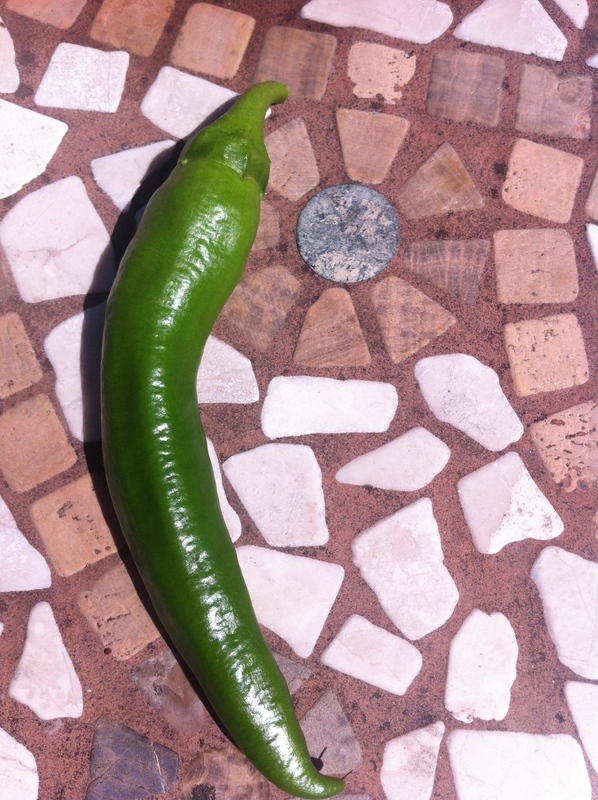 Our first chilli of the season from our greenhouse, which I used to make a very nice lamb curry with. Fiery hot! These baby plum tomatoes also from our greenhouse, are so delicious I could eat the whole lot in one sitting. Perfect for summer salads. 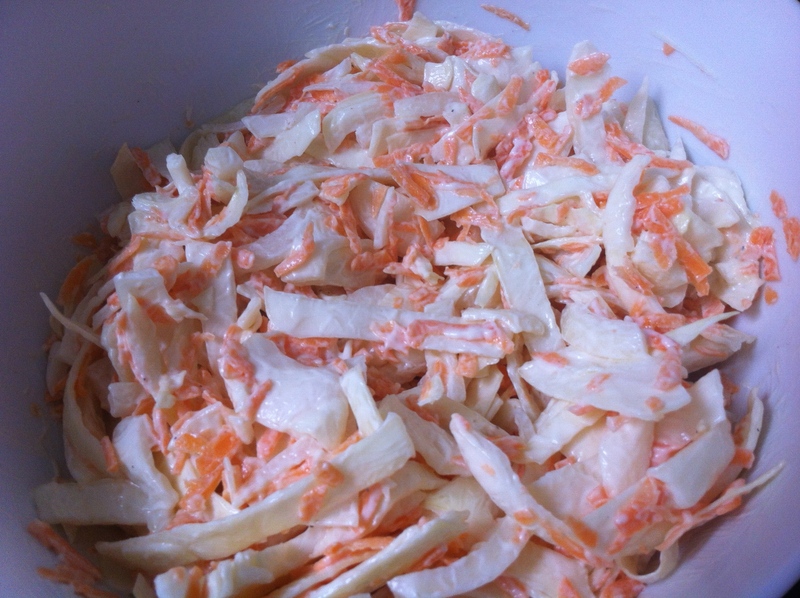 My husband loves home-made coleslaw, so I made some this month with another batch of the home-grown carrots from our vegetable boxes (featured in my July IMK post). Top tip – traditionally lemon juice is used in coleslaw recipes, but this time I used fresh lime juice for a fresh and delicious twist. I volunteer for the Epsom group of the National charity Riding for the Disabled Association. RDA provides disabled adults and children with the opportunity to ride to benefit their health and wellbeing. One of the wonderful volunteers at RDA has their own chickens, which they kindly give to other volunteers who in return make a small donation to RDA. 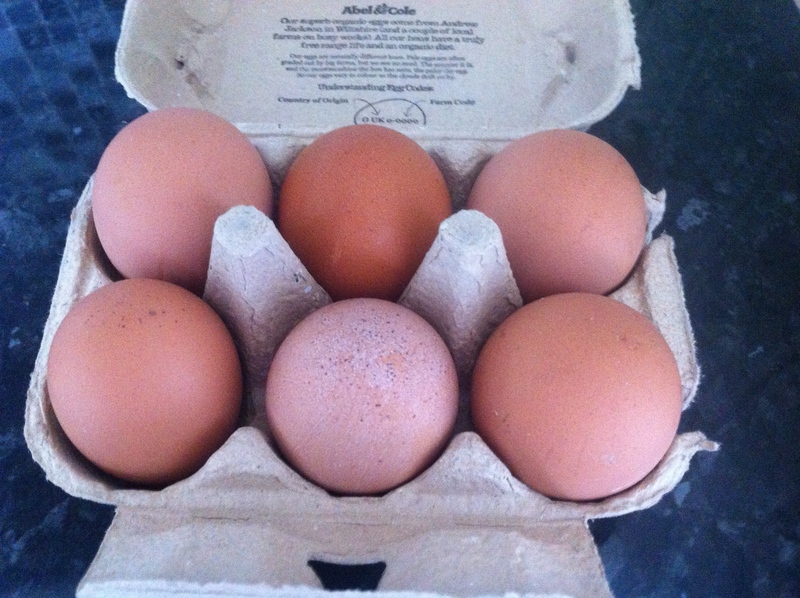 This week to the delight of my husband was my turn on the egg rota. I regularly bake cakes to share with the other volunteers at RDA. 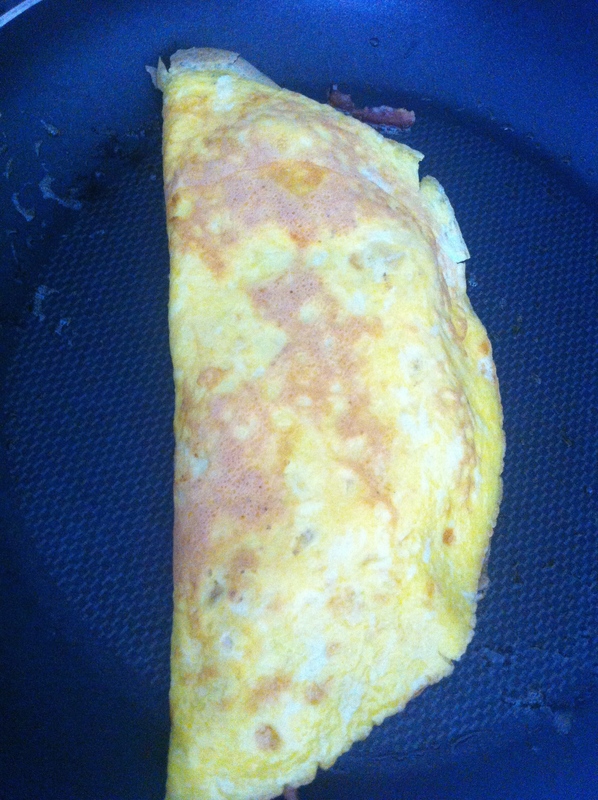 My husband and I have been enjoying the best omelets we have ever tasted this August. The abundance of sunshine this year in the U.K means blackberries are ripening a lot earlier than expected. 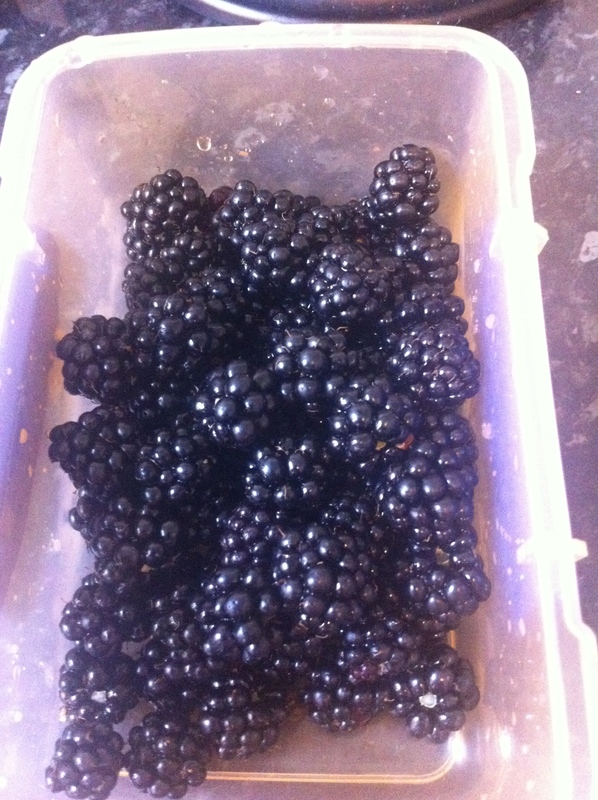 I picked these plump, shiny ones from our garden to make a delicious blackberry and lemon tray bake this week. Long summer evenings call for Parmigiana and a glass of good quality red wine. Unfortunately I have still not been successful in growing an aubergine in the greenhouse. If anyone has any top tips they would be very welcome. My husband was very happy with this freebie being handed out at Waterloo station on his way home from work. Perfect for our home-grown new potatoes and runner beans. You can’t argue with free! 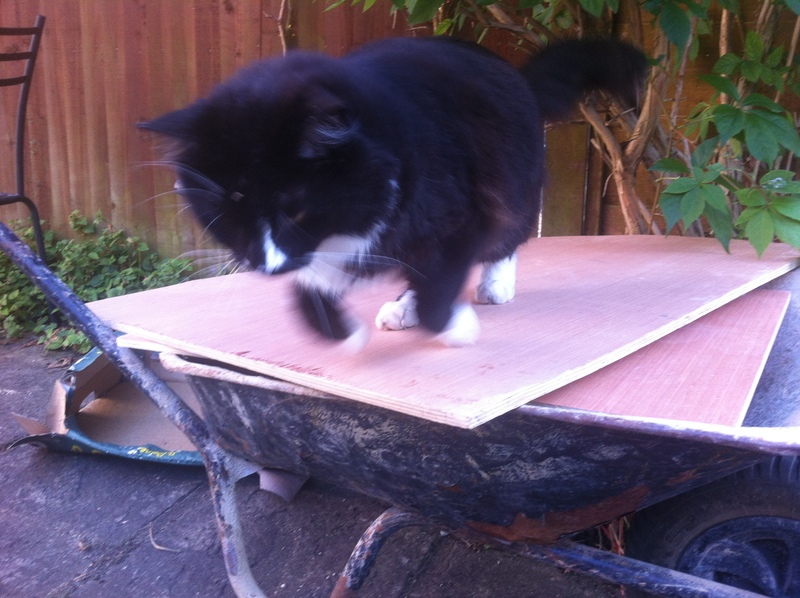 This month we have had a new lawn laid in our garden so Miles has been having an adventure. The new sprinkler has totally blown him away and he sits watching the hose like it is a snake waiting to attack. How lovely you and your hubby grow so many wonderful vegetables Emma. It must be so satisfying doing the volunteer work you do. Give Miles a scratch behind his ear for me. Thank you Mandy. You are always so kind. I love the voluntary work I do at RDA. I am also an occupational therapist so I work with autistic children on a day to day basis. It is very rewarding but challenging too as you can probably imagine. Miles says Hi. Have a wonderful week. I hope your cats are well too. Emma. Emma, your slide shows and the stories behind them were a delight! (I agree with you about supermarket beans.) No wonder Daz chased you around — fresh carrots are the best, aren’t they? 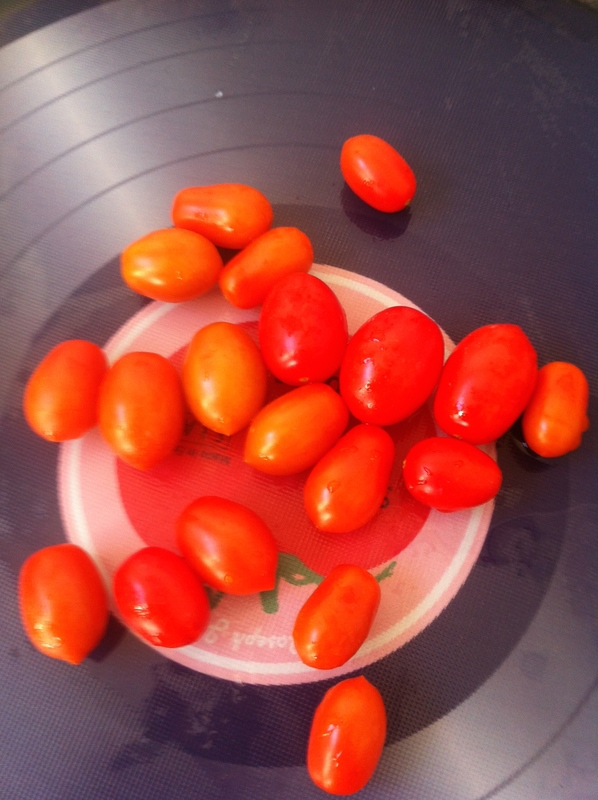 I also like how you photographed your baby plum tomatoes on what looks to be an old LP record album? They’re definitely a ‘hit’! It was also inspiring to learn about your work with RDA. Thank you for your lovely comments. The record that the tomatoes are on is in fact a chopping board. You can get them from Lakeland. I love volunteering at RDA, but I am also an occupational therapist so I work with autistic children on a day to day basis, which is rewarding but challenging at the same time. It is lovely to get to know you better. Have a wonderful week. Emma. Miles says hello Heather. He is pleased someone noticed his stunt work. I am glad you were inspired by the parmigiana. 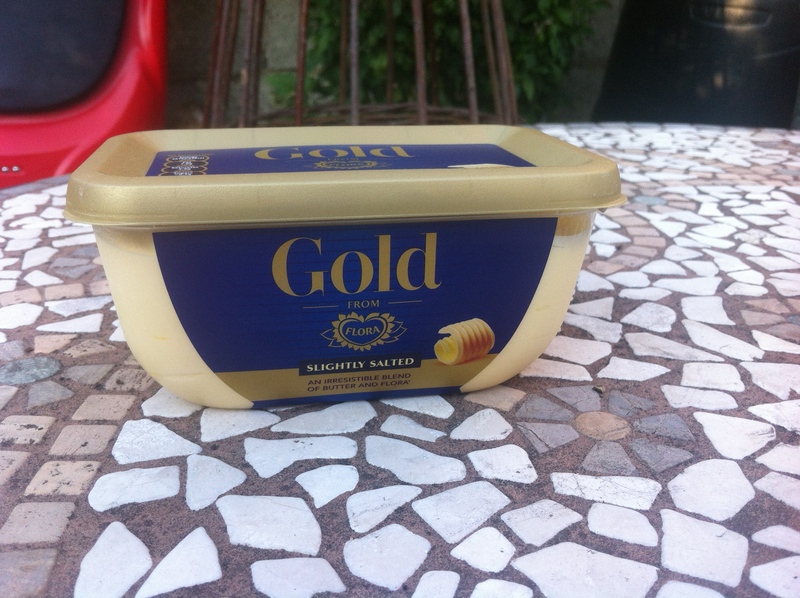 It is one of my favourite meals. You should join in IMK. Emma. That does all look good. Our yard’s too dark to grow much besides some herbs, though those get used quite well. You can’t beat fresh herbs. I am glad you enjoyed the post. It’s such a great way of getting to know other bloggers. Emma. Loved your slideshow and the garden looks amazing Emma. 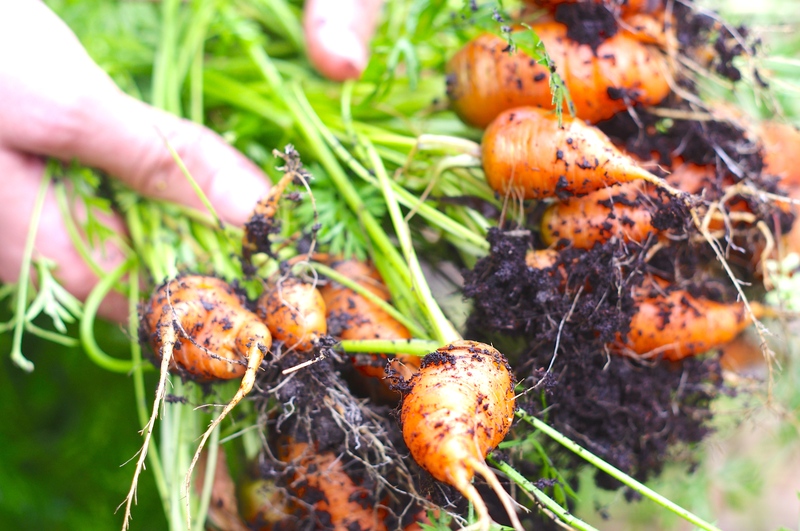 …its so nice to have fresh veggies from your own garden…. Thanks Chitra, so kind of you to say so. I am still so impressed by how often you post recipes and articles on your blog. Emma. Looks like a lovely garden! Our long hot summer is still in full swing, August is when we get hottest and reach the 100s (Fahrenheit). Not much survives that heat so things are slowing in the garden. I planted the pumpkins and loom forward to them though! I’m so glad you enjoyed the post. Take care. Emma. Your home grown produce loks very enticing, and the parmigiana with red wine- my favourite. I am impressed with the slide show with your photos. Something I must learn. I am so glad you enjoyed the IMK post. Thank you for your kind comments. Have a fantastic week. Emma. Thanks Roger. I am glad you enjoyed the post. Is it too hot where you live in France to grow runner beans? I bet you don’t have any trouble with aubergines. That was your parmigiana recipe by the way in the IMK post. My husband’s uncle was a teacher in an international school in Cyprus for a long time and he could grow aubergines in pots on the patio. If you are a reader you might enjoy my post on the Dublin Writer’s museum. It seems to have captured people’s imagination. Take care. Emma. You are right about farm eggs. My husband enjoyed them so much he wants his own chickens now. Take care. Emma. Thank you for your kind comments. I am glad you enjoyed the post. Have a great week. Emma. You are right about fresh eggs. Supermarket eggs are no where near as nice. Emma. Thanks Celia, Daz is so loving, I wish you could meet him. I am really enjoying IMK and it is great to get to know other bloggers. Emma. I am glad you enjoyed the post. Try the lime in the coleslaw too. It gives it a fresh kick. Emma. Your runner beans look so good. I hope to find some seeds to grow them this Spring. Your horse looks very lucky to have a lovely home. Great post Emma, it really is summer in your kitchen with all that beautiful produce! Thank you. Glad you enjoyed the post. Have a great weekend. Emma. Wonderful looking beans. Runner beans from the supermarket always look so limp compared to home grown that if I didn’t grow them then I’d never eat them. 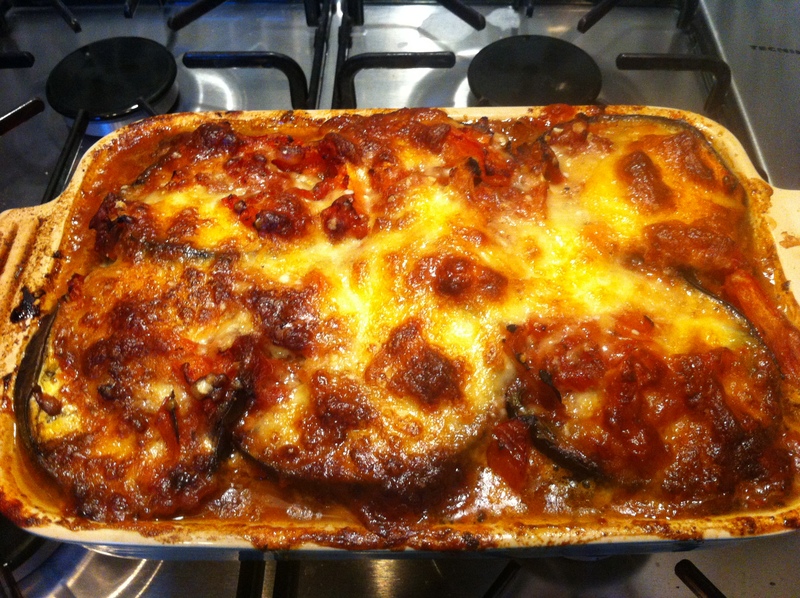 Share the secret for growing aubergines when you get it – I’ve given up trying. Thanks for your kind comments Anne. No magic answers for growing Aubergines yet. I feel I may be joining you in ‘giving up’ soon. Emma. What a great thing to have a greenhouse! My blackberries are also ripening and I’ve just made a batch of blackberry jelly – yum! I bet your blackberry and lemon tray was delicious. Cats and their antics are a wonderful thing to watch. Miles is a delight! We love Miles to bits. 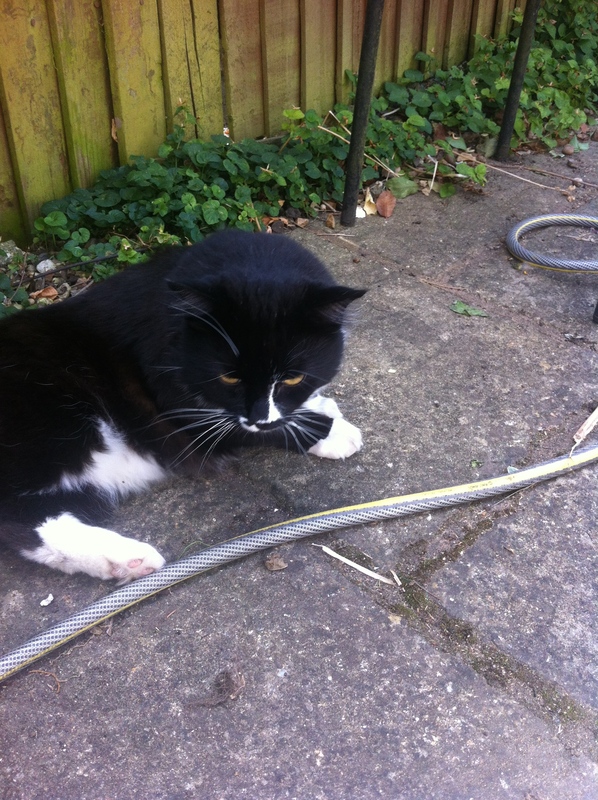 He is a rescue from Battersea Cats and Dogs home in London. You are right cats are fascinating to watch. Miles is a real character. He makes us laugh every day. Emma. Thank you. I am glad you liked the post. Emma. You have a lovely blog too I will be following it.. Miles looks like he loves the garden. I keep saying I want to get a place with a garden, but we keep downsizing so that dream is on hold. Thank you. Miles is definitely our garden director. I hope you get a garden soon. Emma.